OAKLAND (California) • When it is time for free agency in the summer, Kevin Durant and Klay Thompson might just want to highlight to potential suitors what they can do, especially after their late heroics on Monday night. 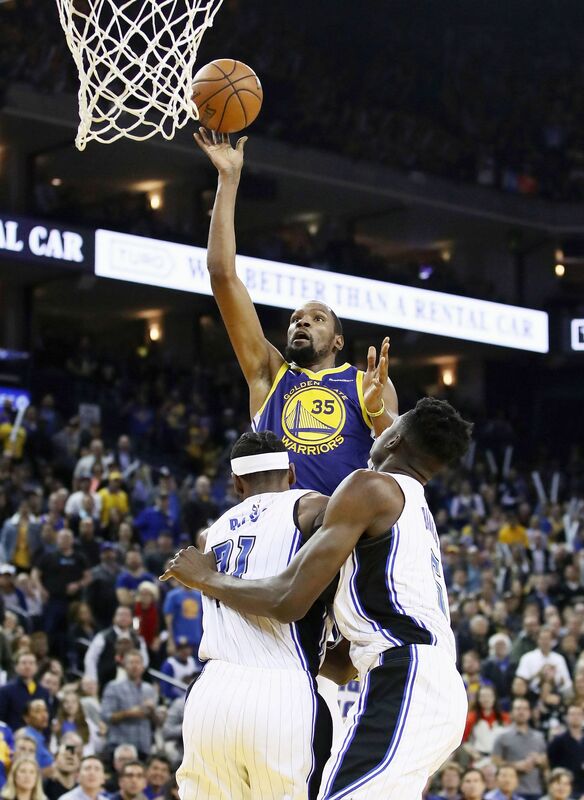 With guard Stephen Curry and forward Draymond Green still out injured, the duo almost single-handedly led the Golden State Warriors to a 116-110 National Basketball Association victory over the Orlando Magic at the Oracle Arena. Durant scored a season-high 49 points - connecting on 16 of his 33 shots, four of his 10 three-point attempts and all 13 of his free throws en route to the fifth-highest scoring game of his career. It was also his highest since he poured in 51 for Oklahoma City at Toronto in March 2014. Thompson backed Durant with 29 points, as Golden State's two All-Stars combined for 78 points while their teammates added 38. "They both were just in attack mode," head coach Steve Kerr said. "They both know, especially with Steph out, that they need to be really, really aggressive, and they both were. They were amazing." Warriors forward Kevon Looney, who had six points, added: "It's a great luxury that we have (Durant) and Klay making big shots down the stretch. "We know that if we do our job on the defensive end and do all the small things, those guys will take us home." The Warriors (15-7) trailed by as many as 18 points before chipping away in the third and fourth quarters, finally taking a 102-100 lead on a three-pointer by Thompson with 5min 26sec to go. After Orlando regrouped to go back up by three, another three-pointer by Thompson drew the Warriors even at 107-all with 1:45 left before Durant took over. He put the Warriors up by three with a three-point play with 1:19 to go, then boosted the lead to four with a three-pointer after Terrence Ross had pulled the Magic back to within 110-109. Durant completed his game-ending flurry with a pair of clinching free throws, delivering Golden State their third win in four days. Nikola Vucevic had 30 points and Ross added 28 for the Magic (10-11), who lost their 11th straight to Golden State. "I still missed 17 shots," Durant said, scanning the box score. "I feel like I had some shots that I wish I could have made, last game and this game. Just got to get back in the gym."